In this article, we are going to provide some pointers on how to prepare your material for mastering, specifically when doing so at Magnetic Fidelity. Our methods of working could be very different to what your are used to, so the advice given will help you make the most of your music and the mastering process. In recent times, it has become customary for artists, producers and record labels, to jump into the nearest recording studio for a fast and clumsy tracking session. The result of this tracking session is passed on to an unsuspecting mixing engineer, who is expected to sort of make it work, without being told much about how it was actually recorded, and without having much of a say on this. When the mixing is done, it is then passed on to an even more unsuspecting mastering engineer, who is expected to turn this into an album, which should somehow work on the average consumer's sound system. Finally, the master is delivered to a media production plant, where it is placed onto the final medium, usually without being listened to in the process. Little to no consideration is given to the compatibility between the different facilities and the different working methods of each person along the way. While a great deal of albums are made this way nowadays, the results are often hugely compromised. It is important to view the creation of an album as one process with multiple stages, that have to be seamlessly compatible with each other, so the album can flow out of its intellectual state through the various channels of electronics, into the molds of the final product. As such, it is important to involve all the professionals, who will work on the album, from the beginning to the end, to ensure, that they can harmonically work together. At Magnetic Fidelity, our engineers, are always happy to be involved as early on as possible in a project, even before the tracking session begins. They are available to answer all your questions regarding the technical and aesthetic aspects of the tracking and mixing sessions and are always happy to communicate with the relevant engineers. This becomes especially critical when any doubt or confusion exists regarding the media and formats chosen at each step of the process, which are used to transfer the material to the next step of the process. This is the single detail where most mistakes happen in the creation process of an album. Such mistakes can reduce the quality of the sound or even incur unplanned expenses when the mixing engineer finds out, that he is not able to work from the medium, that the tracking engineer has delivered and so on. Often, tracking and mixing studios do not have the acoustic environment and detailed monitoring system, that can reveal potential problems in the sound, which is why mastering engineers often send entire albums back to the mixing stage. With the recent trend of albums being recorded in home studios, this is more exaggerated than ever before. To avoid such problems, it can be useful for engineers to provide us with working mixes that we can listen to in our detailed audio microscope of a monitoring system and room, identify any potential problems, and suggest improvements. Such feedback can be useful to a mixing engineer to improve their mix, which in turn will result in a better final product. The work of the mastering engineer greatly depends on the quality of the material coming in. So, the first important piece of advice, is to involve us early on in the process. Do not be afraid to ask us questions, we see it as part of our job to answer them. You are welcome to share your artistic vision with us and we will strive to suggest the best working methods for achieving your goal. How to mix for vinyl/CD/cassette tape/etc. The best way to mix for vinyl is to not mix for vinyl! There is no point in trying to alter something in your mix that could magically make it sit better on any medium. These steps are done in the mastering process, by engineers, who are well aware of the particularities of each format. Whatever you do, do not cut away the high frequencies above 16 kHz or so and do not cut away the low frequencies under 50 Hz or whatever the latest trend says you should do, unless what you really want to end up with, is a bad sounding album. There are plenty of theories about vinyl records having a limited frequency response, but it is all nonsense. The industry standard disk cutting equipment, that most people use, have a frequency response that is virtually flat from around 8 Hz to near 25 kHz without using any special techniques. When you go to the territory of half speed mastering, the high frequency response can be extended to around 50 kHz. If there is any part of the frequency spectrum that can be reduced or removed, this will be done at the time of cutting the record and definitely not in the mixing stage. As for the stereophonic image, again, as long as you are using sensible stereophonic techniques, you shouldn't have to do something special for vinyl records. By sensible, we mean, things like keeping the very low frequency instruments centered and ensuring, that there is no extreme phase differences between the left and right channels, especially at the low frequencies under 100 Hz or so. However, this advice is not limited to vinyl records. All media will sound vastly better on the majority of sound systems, if these rules are observed. Another important aspect of tracking and mixing is to keep on checking the monophonic compatibility of what you are working on. Try listening to it in monophonic mode and see what it sounds like. If things start to magically disappear, for instance if you have a big boomy bass sound in stereo and then suddenly no bass in mono, or if the guitars suddenly disappear in mono or if the vocals disappear, this is a sure sign of phase problems between the left and right channel. Although most listening environments offer stereophonic sound nowadays, there are still some exceptions such as some concert venues, night clubs, radio stations and badly adjusted sound systems in general, where mono compatibility suddenly becomes vital. Unfortunately, it is becoming common for people to deliver their material to a mastering engineer with a note, saying "just master it" or something similar. Mastering is quite an elaborate art which can greatly affect the end result. It can range from a very subtle effect to a mind blowing transformation depending on the requirements of the artist or producer. It is always good to have a bit of a vision and some ideas on how you would like your album to sound. We can then use our expertise and all the tools at our disposal to make it happen. During the mastering process, your material will be optimised for each medium in which it is going to be released. Furthermore, it will be optimised for the environment, working methods and personal preferences of the engineers at the media production plant of your choice. It is recommended that you do a bit of research and decide what formats you will be releasing your album in and which factory will handle the duplication/replication/pressing, prior to the mastering session. If you are planning on a DIY, short run release, where you will be dubbing some tapes at home or burning some CD-R's, just let us know exactly what you plan on doing and how you plan on doing it. We will then recommend the best option for a delivery format, which you can use as your master. 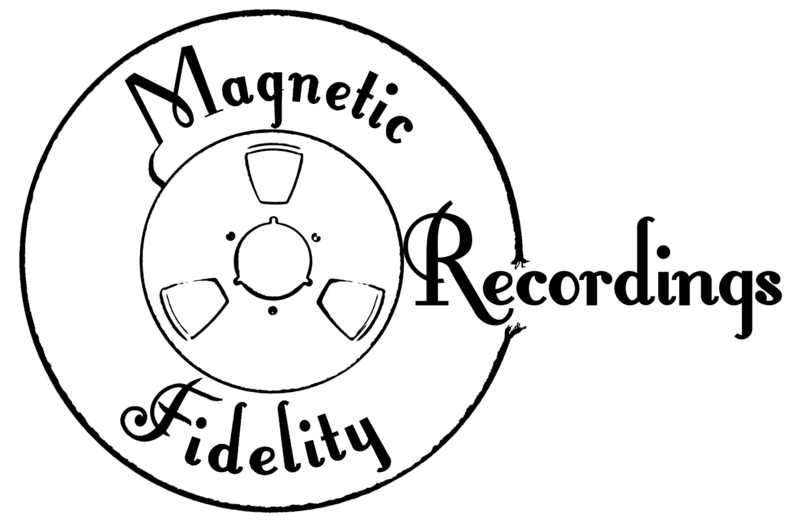 At Magnetic Fidelity we are just as serious about someone planning on doing a run of 50 cassette tapes using some Hi-Fi tape decks at home, as we are about a major record label planning on pressing thousands of vinyl records of a well known band. Music is music and it is just as important at all levels. No snobbery around here, we also had to start somewhere and we also did start with DIY tape dubs of weird music at home. Most artists and producers closely follow each step of the process and carefully listen to the material as it gets passed on from one stage to the next. Similarly, you should always request test pressings and reference CD's/tapes and even the good old reference acetates, to ensure that nothing goes wrong in the mass production process. Mistakes are very common in these environments. While most mistakes would be noticed and rectified by specialists at reputable production plants, not all mistakes are identified early enough, so spending a tiny fraction of the cost of your production run on a test pressing could easily save a run of hundreds of records from coming out faulty. Keep in mind, that the majority of currently operating media production plants will not accept responsibility for mistakes unless reference material had been issued and approved before the production run commences. Tempting though it may be, it is not a good idea to start giving out your music before the complete process, including mastering, has been finished. Many artists get excited and post rough mixes on the internet or give out CD's to their friends. This usually results in the music rapidly circulating on the internet with the risk of a lot of people hearing the music in its unfinished state. If there are any problems in these early versions of the music it could be very easy for bad opinions to be formed on an album, which might actually come out really good sounding in the end. Don't risk it, just wait a tiny bit longer and the world can then fully appreciate your efforts. Artists and producers often attend mixing and mastering sessions. These sessions usually take place in studios unfamiliar to the artists and producers involved. This might sound obvious, but each space and monitoring system sounds different. Unless you are very confident, that you are able to adjust to the environment you are in fast enough, be very careful when making suggestions regarding the sound. A funny situation commonly encountered as a result of careless suggestions, is, when a band asks the mixing engineer to lower the levels of the cymbals and raise the level of the bass and bass drum, probably boost the low frequencies a bit too, and bury these vocals more into the mix. Then, the same people arrive at the mastering session, where they suffer panic attacks when realising, that they would now need to raise the level of the cymbals, bring up the vocals, lower the level of the bass and bass drum and cut away these extreme low frequencies. This is a sure trip back to the mixing stage. This beautifully highlights another issue, which is the appropriate choice of engineers for each step of the process, who seem to understand what you want to do. When you find the right people, it might be best to just trust them with decisions on the sound as they are guaranteed to know their monitoring system better than you. The same goes with the tracking engineer and even more so with the mastering engineer. The best time to use your own judgement to make suggestions about the sound is after a careful listening session at your own pace in your own space, in comparison with albums, whose sound you are definitely familiar with. Which is precisely why each engineer usually offers a reference CD or tape after each stage for you to take home and carefully listen to. Many artists are wishing to complete some part of their recording process on their own, usually in a DIY home studio, while trusting other parts to professionals, who will hopefully be able to give it a bit of a magic touch. So it is common, that bands track everything in a garage and then take these tracks to a professional mixing studio for the mixing stage. However, this is a bit of doing things the wrong way around. The most difficult part to get right in a recording session, is the acoustics of the space, the quality of the microphones, preamplifiers and signal procesing units, as well as an experienced tracking engineer, who knows what to do with all that stuff. It is probably therefore a good idea to actually use a professional facility for the tracking and then try to do the mixing in a DIY fashion. If it fails, you still have the excellent tracking session to take to a professional mixing facility to do it right. On the other hand, if you have substandard tracking, no equipment and no engineer will ever make it sound really professional. The mastering on the other hand, is pretty difficult to DIY, since it requires an excellent acoustic space with an outlandishly good monitoring system, exceptionally good signal processing and vast amounts of experience. Mastering is usually the shortest in duration and least expensive stage of creating an album, while at the same time being the most defining stage. Given excellent musicians, tracking and mixing, it is the mastering stage, which can really propel an album into orbit in the universe of truly professional sound, or condemn it forever in the infinite depths of mediocrity.